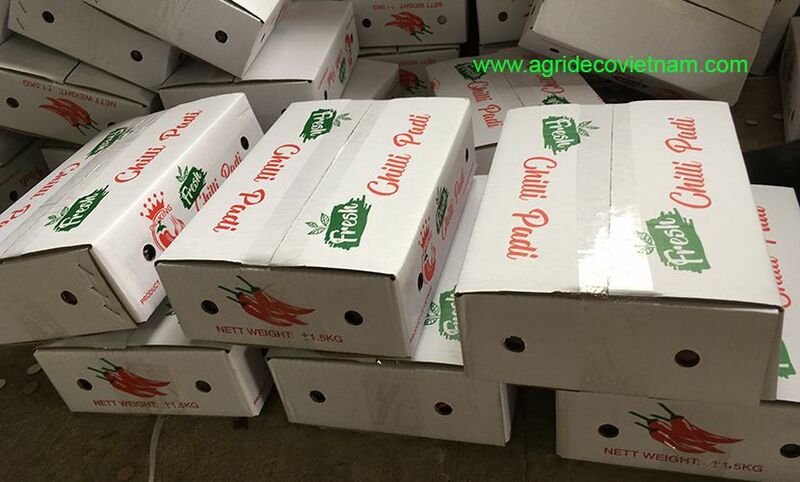 Fresh (Frozen) chilli - Agrideco Vietnam Co., Ltd.
Fresh chilli is sporadically planted in provinces: Hai Phong, Hai Duong, Thai Binh, Dong Nai, Lang Son… Average capacity ranges from 10 MTs to 15 MTs per hectare. Normally, the first season of Vietnamese fresh chilli begins in April and finishes in August. Then, farmers take time to harvest and improve soil. After that, they cultivate the second season and harvest in February of the following year. Therefore, Vietnam can supply fresh chilli for export in eight months a year. For frozen chilli, we can export all year round. There are many kinds of fresh chilli in Vietnam, in which small chilli dominates more than 70%. Compared to other spices, cultivation area of chilli in Vietnam is pretty large. The estimate total area is 10,000 hectares, with a total quantity of more than 100,000 MTs. Most of fresh chilli planting in Vietnam is for export. As a result, Vietnamese fresh chilli has entered into many countries and territories in the world. China, The Middle East, Malaysia… are our main export markets. In the meanwhile, frozen chilli is mostly exported to South Korea for processing Kim Chi. 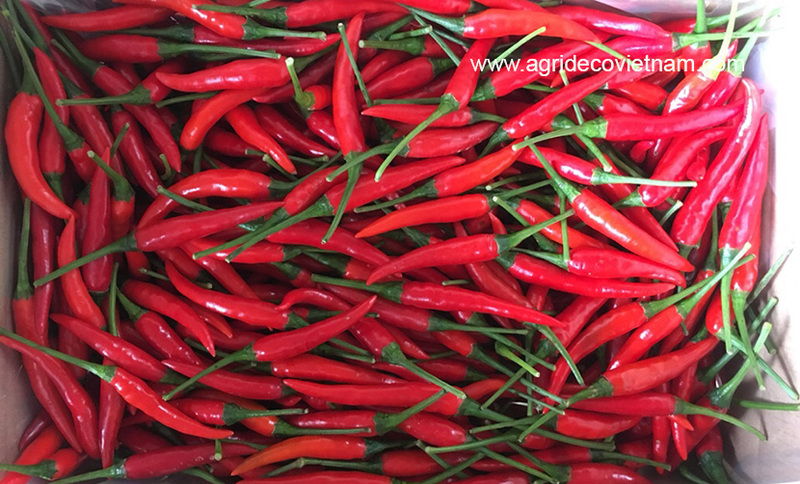 With many years of exporting experiences, Agrideco Vietnam Co., Ltd. is proud to be a reliable supplier of Vietnamese chilli. 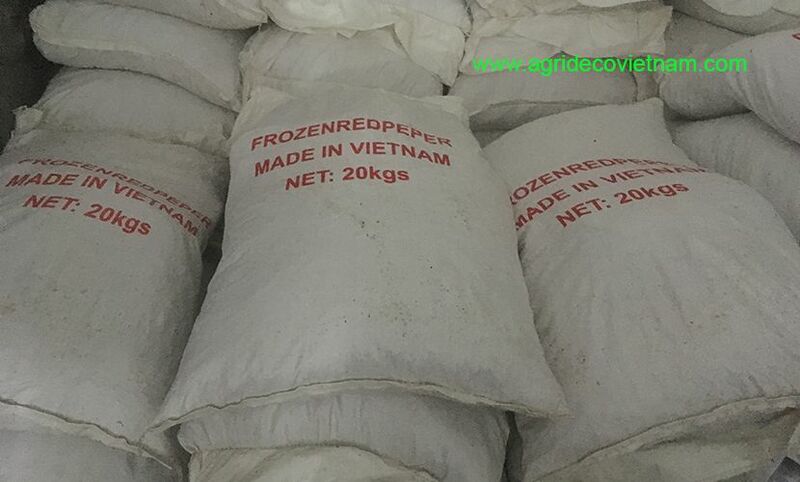 We export Vietnamese chilli in two form: fresh chilli and frozen chilli. With a guideline “Quality in everything we do”, we focus all on product quality. In addition, our chilli is good – looking and more competitive prices that creates the added value for our customers. For this reason, we are looking forward to introducing a very great condiment from Vietnam to global customers. Our business philosophy is to share risk and profit with customers. Furthermore, we are doing the best to make the world greater with Vietnamese taste. In summary, we would like to be your reliable partner to bring Vietnamese high quality spice to the world. In addition, if customers need samples, we will send them to customers. The samples are free but freight, customs fees, and other fees are customers’ responsibility.